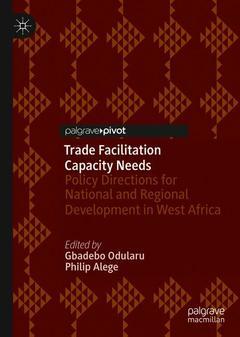 This book provides a comprehensive analysis of both national and regional trade facilitation capacities, issues, challenges and lessons, with a special interest in sustainably advancing West Africa?s regional trade facilitation agenda. It examines the contributions of trade facilitation towards enhancing regional integration and economic expansion in the face of increasing non-tariff barriers that highly characterises West African agri-food and non-agricultural markets. The authors recommend new conceptual frameworks, appropriate initiatives, and workable policy recipes towards enhancing West Africa?s trade facilitation agenda as well as the regional economic transformation trajectory in the face of the ongoing African Continental Free Trade Agreements (AfCFTA). The book underscores the geopolitics, opportunities and challenges that confront West Africa in the increasingly dynamic regional trade facilitation policy space. Readers will learn how West Africa can improve its regional trade facilitation game amidst emerging capacity challenges. Gbadebo Odularu is a Research Associate at the Centre for Research on Political Economy (CREPOL), Dakar-Yoff, Senegal. Professor Odularu is also affiliated with the School of Business and Technology, Marymount University, Arlington, as well as the American Heritage University of Southern California (AHUSC), USA. Philip Alege is a Professor in the Department of Economics and Development Studies and Dean of the College of Business and Social Sciences at Covenant University, Ota, Nigeria.